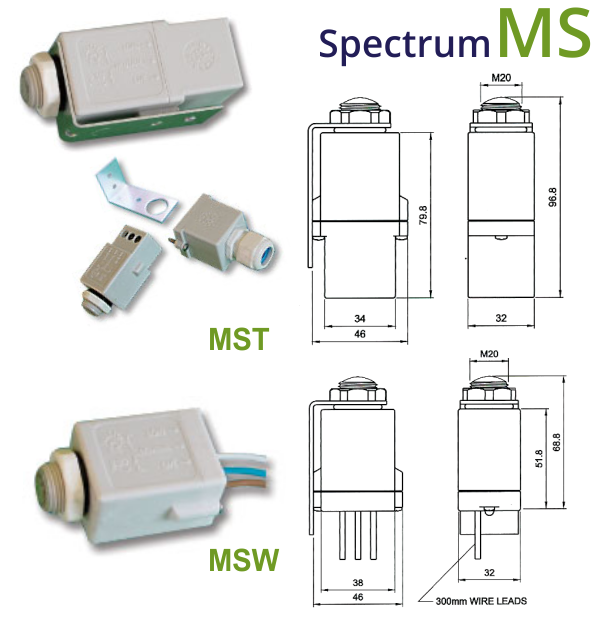 The SPECTRUM MS range of PECUS are especially suitable for mounting inside enclosures such as substations and electrical box enclosures. The MST type PECU has an M20 threaded entry with terminal block connections inside. The MSW type PECU is supplied with 300mm wire leads. Fixing the MS PECU may be either by the enclosed bracket or by securing the PECU in a 20mm diameter hole with the enclosed locknut together with rubber seal. Especially suitable for mounting inside enclosures. *All models available with timer options.